Just here to inform you the difference between the Bonacure Color Save (old packaging) and their new one which is Color Freeze. As we all know, Color Save is Sulfate Free! That is one of the reasons why people love this shampoo including my friend Karmun who recommended this shampoo to me, and I. This is the old packaging, well kinda looks the same but the label is different. When it comes to buying products it is important to look at the labels, not just the packaging anymore. All thanks to BC Bonacure, now we have to look at the labels while purchasing their products unlike before where we can just grab it once we see it cause of the packaging. Pink colored packaging under Boncare is for coloured hair, people who use their shampoo would know that. But I have no idea why did they create another color shampoo under the SAME COLORED PACKAGING. It is ridiculous! Especially if you're in a rush and when you see your shampoo you just wanna grab and ciao but now you have to read properly and check if this is the "Sulfate-Free" or "Color Shine" range. 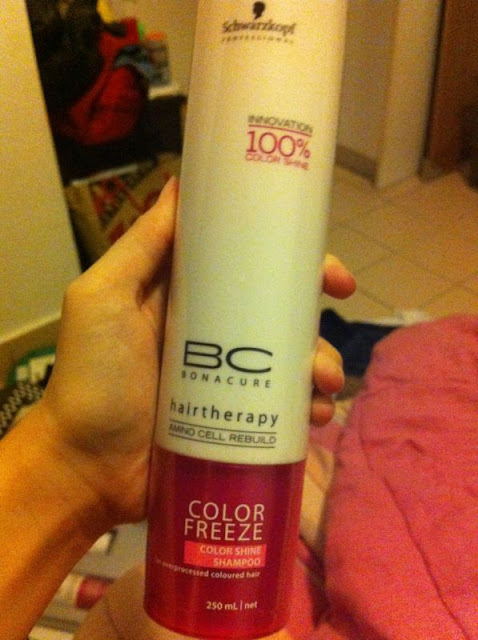 So far for COLOR FREEZE I've not seen any with the label Sulfate-Free, I've only seen it online on other blogs from overseas. So here's a note to you all Bonacure lovers! If you prefer Sulfate-Free Shampoos and been using the Color Save for a while now, please check the labels properly before purchasing. I can assure you that the COLOR Shine Range has Sodium Laureth Sulfate because it is stated in the ingredients at the back.